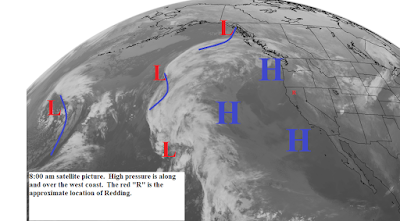 High pressure is along and over the west coast. Today and Thursday we will see sunny skies with daytime temperatures 10 to 15 degrees above normal. Gusty north winds will occur in some areas today. Friday the high pressure ridge will begin to slowly weaken. This will allow temperatures to slowly cool. We will continue to have partly to mostly sunny skies with a few high clouds from frontal systems moving by to our north. Winds will be light. The ridge will have weakened enough by next Tuesday to allow the jetstream drop close to Northern California (see map below). Tuesday and early Wednesday a weak frontal system and low pressure trough will move through the north state. This system will bring showers to the higher elevations and a chance of a sprinkle in the valley.